Of that egregious title, readers might well demand: —Essential— to whom? 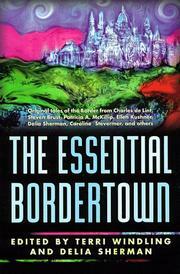 Still, fans of Emma Bull’s Finder (1994) and the various other Bordertown yarns that have appeared over the years will be familiar with the urban-fantasy backdrop: magical Elfland has reappeared, slap in the middle of contemporary America; the buffer zone between Elfland and the US is Bordertown, where both science and magic work, though intermittently and unreliably, and where refugees, misfits, strays, and runaways congregate. Among the 13 contributors here are Patricia A. McKillip, Midori Snyder, editor Sherman, Elisabeth Kushner, Charles de Lint, Caroline Stevermer, and Steven Brust, while editor Windling (she dreamed up the whole shebang) provides most of the “guide pieces” that should help newcomers orient themselves. Beware, however, of the aggressively elfpunk approach: “We’re going to give you a history lesson instead. Shut up, pay attention.” The jury’s still out on shared-world anthologies. Do they inspire the deeper exploration of themes and issues, yield richer concepts through the wider creative input, and show the f/sf community’s true cooperative spirit? Or do they merely featherbed mediocre or lazy authors, encourage a clubby atmosphere, and kill originality stone dead? Over to you.